"Their territory extends for several thousands of li. It has more than four hundred walled towns. There are several tens of smaller dependent kingdoms. The walls of the towns are made of stone. They have established postal relays at intervals, which are all plastered and whitewashed. There are pines and cypresses, as well as trees and plants of all kinds. Their kings are not permanent. They select and appoint the most worthy man. If there are unexpected calamities in the kingdom, such as frequent extraordinary winds or rains, he is unceremoniously rejected and replaced. The one who has been dismissed quietly accepts his demotion, and is not angry. The people of this country are all tall and honest. They resemble the people of the China and that is why we call this kingdom Da Qin ['Great China']." — Gan Ying, prospective Chinese ambassador to Rome, c. 97 A.D.
Home of temples with even bigger columns, and brutal sword-wielding Roman legionaries, all of whom had extremely clean, well-kept, elaborate armour and helmets (even down to the lowliest grunt soldier). Also home to gladiators, mad emperors and elaborately coiffed women with slinky, see-thru stolas. Expect to see a lion eating a Christian or two. A time when Classical Mythology was Serious Business for the pious. For more on the actual facts of the place, see The Roman Empire. The Roman Republic is less often depicted in fiction, except for the bit right at the end when it became The Roman Empire (though occasionally you will see fiction set against the earlier struggle with Carthage or, more often, the slave revolt of Spartacus). Roman architecture featured much more bricks than marble, but in the intervening centuries most of the bricks either crumbled, collapsed or were just stolen to make other buildings while those useless marble blocks and columns were left pretty much alone, so in Hollywood movies you're now treated to the sight of Imperial Rome made of shiny, gleaming travertino marble, with little or no brick houses to be seen. Sword & Sandal works may feature a Fantasy Counterpart Culture. May overlap with Bible Times. See Ancient Grome for unwitting crossovers with Ancient Greece. Colour-Coded Patrician: Only the patrician class could wear Tyrian Purple. Evil Matriarch: Shows up a lot in the surviving documents of Rome. Fed to the Beast: The aforementioned Roman habit of throwing people to the lions. Thermae Romae, set in the reign of Emperor Hadrian (and in 21st century Japan). Axis Powers Hetalia has a character who is the personification of Ancient Rome, affectionately referred to as "Grandpa Rome" by his descendant Italy. While most of the series is set in more modern times, there are some comics that are from this time period. Nero: In "De Rode Keizer" Nero and his friends travel back to the era of Emperor Nero, which of course leads to a lot of confusion. Nero Fox (the "Jive-Jumping Emperor of Ancient Rome"), a Golden Age DC Comics Funny Animal character who was emperor of ancient Rome. The "jive-jumping" part referred to his anachronistic playing of 40s-era jazz/swing music on his "gobble pipe" (saxophone). His era's later revisited in The '80s by a time-traveling Captain Carrot and His Amazing Zoo Crew!. The Sandman #30, "August", in which Morpheus visits the Emperor Augustus. Suske en Wiske: The stories "Het Geheim van de Gladiatoren" and "De Nerveuze Nerviërs" take place in this time period. Agora, set in Roman Egypt. Carry On Cleo, a parody of the 1960s' Cleopatra box office bomb. Centurion, set among the Ninth Legion in Scotland, right when Hadrian pulled back. The Last Legion, also about the Ninth Legion. Monty Python's Life of Brian: takes place in Judea during life of Jesus Christ. Paul, Apostle of Christ, set in Rome in 67 A.D.
Pharsalia (61-65) by Lucan. It is an epic poem which covers the Roman Civil Wars. The Decline and Fall of the Roman Empire (1776-1789) by Edward Gibbon's is considered the definitive, most exhaustively researched book ever written on the topic of history. It is a massive tome which took the better part of Gibbon's life to complete, as virtually every sentence is cited. Famously ignores all emperors from Augustus to Nerva (27 BC-98 AD). Starts with the rise of Trajan in 98 AD and continues through the entire history of The Roman Empire, and the Byzantine Empire. A lengthy legacy section follows events into The Renaissance. The Last Days of Pompeii (1834) by Edward Bulwer-Lytton. Adapted to film many times. Römische Geschichte (Roman History, 1854-1856) by Theodor Mommsen is a detailed work on the history of The Roman Republic. 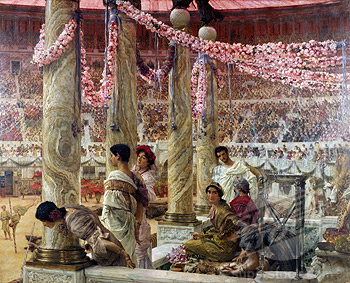 Followed by the sequel The Provinces of the Roman Empire (1885-1886) which is also very detailed. The primary work earned the author the 1902 Nobel Prize in Literature. Mommsen had also prepared another sequel, covering The Roman Empire, but never finished it. His notes and plans for the incomplete work were first published in 1992. Quo Vadis? (1896) by Henryk Sienkiewicz. The Silver Chalice (1952) by Thomas B. Costain. Made into an infamously bad movie in 1954. Detectives in Togas (1953) by Henry Winterfeld. The Eagle of the Ninth (1954), Outcast (1955), The Silver Branch (1957), The Lantern Bearers (1959), The Mark of the Horse Lord (1965), Song for a Dark Queen (1977), Frontier Wolf (1980), and a number of shorter works by Rosemary Sutcliff. Ecce Romani, the Latin textbook. First published in 1971. Cambridge Latin Course, the UK's counterpart to Ecce Romani. The Marcus Didius Falco series of detective novels. Started in 1989. Masters of Rome series by Colleen McCullough's . Started in 1990. The Roma Sub Rosa series by Steven Saylor. Started in 1991. Time Scout spends a lot of time in Ancient Rome. The series started in 1995. The Roman Mysteries by Caroline Lawrence. Started in 2001. Lest Darkness Fall by L. Sprague de Camp is an Alternate History sparked when a professor is teleported from the 20th century into ancient Rome and stops it from falling. To Bring The Light is an alternate history in the other direction - someone from a future Rome is brought to bring about the founding of Rome. Romanitas by Sophia McDougall is another alternate timeline diverging with the success of Pertinax as Caesar after Commodus' death. The Light Bearer by Donna Gillespie follows the son of a Roman nobleman and a woman from a Germanic tribe. I, Claudius and Claudius the God by Robert Graves. The Mark of the Lion trilogy by Francine Rivers, set circa A.D. 70. Published in the 1990s. Imperium, Robert Harris' trilogy chronicling the life of the lawyer and politician Cicero. Daluz from the novella A Taste of Honey is a fantasy version of the Roman Empire, but with Physical Gods and Terra-de-Luce as an Expy of the city of Rome. Lucrio is a tricenturion in the Daluçan army and his fighting style and uniform sounds exactly like that of a roman legionare. The Daluçan also speak Latin. The Doctor Who episodes "The Romans" obviously, "The Fires of Pompeii" and "The Pandorica Opens"
Plebs, a Britcom about a couple of plebeians trying to get by in Rome. One of the eras in Pro Pinball: Timeshock! is named "Ancient Rome". The "Festa Italia" area at Busch Gardens Williamsburg is entirely themed around Ancient Rome. The Parc Asterix in Plailly, France, features the cartoonish version of Rome from the Asterix comics. Tales of the Galli: Set in Rome circa 312 c.e. Deities has an arc set in Ancient Rome. The Histeria! episodes "A Blast From the Past" and "Return to Rome"
Looney Tunes short "Roman Legion-Hare", with Centurion General Yosemite Sam after Bugs Bunny. Il était une fois...: Despite its name, the seventh episode "Pax Romana" actually takes place during the time of Julius Caesar and follows two Gallic prisoners being led from Alesia to Rome, where they are lauded during the Gladiator Games, build roads throughout their former homeland, and eventually serve a wealthy man whose wife and children's lives they save from a house fire. The episode ends with Caesar's assassination... and with the birth of Jesus forty-four years later.